I want to follow up my previous post with a commentary on the true cost of shootings. As we now know, 2 Kentucky high school students were killed and 18 injured by a 15 year old with a gun on Wednesday. Let me say that again- 2 killed and 18 injured by one 15 year old with a gun. There is no logical or reasonable explanation for what happened that day. Nor is there ever an explanation that makes any common sense for why a young person with access to a gun they should not been able to access takes it to a school and shoots peers. Surely they are not thinking about the consequences of their actions. They are in the moment of whatever was in their heads to cause them to massacre other innocent human beings. The true cost of this culture that exists almost exclusively in America, is, of course, death and devastation that affects families and friends for the remainder of their lives. The true cost is the phone calls that change lives forever. A daughter whose last act was to try to talk to her parents. One cannot imagine what that would be like for the young girl whose life was violently snuffed out senselessly and avoidably. Senseless. How many times have we said that and I have written that? For one family, the phone call will forever be a nightmare. It is only one part of the cost of shootings and gun violence in America that far too many families experience every day. My family has experienced the phone call- a phone call I will never forget. I will never forget the voice of my sister’s son telling me to sit down while he delivered the news of my sister’s death in a domestic shooting. For the other, hearing about a school shooting via media ( not sure how) or some kind of message that they should not have had to hear wondering if their own son was a victim. Those killed will never experience another sunrise or a sunset. Families and friends will grieve and try to deal in the best way they know how with the devastating loss of their son, daughter, sister, mother, brother, aunt, friend, husband, wife….. In time, they will be able to enjoy the simple things in life like enjoying a sunrise, eating out, traveling, family events, holidays, etc. It will be very difficult and nothing will be the same. The tears will flow unexpectedly in a moment of a fleeting memory or something to remind one of their lost loved one. A scene, a look in someone’s eyes, a person who looks eerily like the loved one, going to a place loved by the victim, a toast to the person killed at a family event, etc. The true cost of gun violence and shootings is unimaginable. There are economic costs. There are emotional costs. There are court costs, health care costs, law enforcement costs, even the cost of cleaning up a horrific crime scene. Sandy Hook Elementary school was torn down after that massacre. Emergency responders suffer from PTSD after some of these deadly and bloody mass shooting. Too many memories. The one article about the economic costs asks if America can afford the cost of gun violence? The answer is a resounding NO. This is what gets lost in the ludicrous debate over gun rights. Those on the side of never agreeing to common sense laws that could save lives don’t get this reality. For them, it appears to be the cost of “freedom”. They are free to enjoy the sunrises and sunsets. They have no memories of a loved one whose life was violently and suddenly taken by someone with a gun in his/her hand loaded with bullets intended for innocent people whose only fault was being in the right place at the right time going to school, work, or wherever shootings occur suddenly. It is not inevitable or normal for so many parents to lose children so violently in senseless and avoidable school shootings. That is why I have been and will continue to work to make sure Americans get to see the sunrises and sunsets and enjoy life, liberty and the pursuit of happiness. Guns in airports- the new normal? As it turns out 44 states allow permit holders to carry guns in the common unsecured areas at airports across the country. Coincidentally, Florida is not one of them. But that didn’t factor into the mass shooting at the Ft. Lauderdale airport yesterday. I have been wondering ,since I assume the gun lobby reaction might be this-would someone with a loaded gun, assuming they had not been on a flight because guns are not allowed for passengers traveling on planes, had stopped the shooter? Very doubtful. As we have seen now after watching many videos and hearing from travelers, panic and chaos ensued. People ran, abandoning their luggage, wherever they could to save themselves from being shot. They ended on the tarmac, parking areas, hiding behind cars or luggage. They grabbed their children, their mothers, their friends and ran. That is the first response to an active shooter. Keep yourself and your family from being shot. Adding one more person with a gun to the mix of panic and chaos would have assured even more confusion and possibly more deaths and injuries. 5 people are dead and 8 injured by bullets. Others were injured in the rush to escape. More families are grieving. More families are worried at the sides of hospital beds. 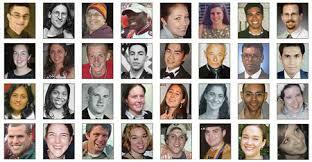 More people affected by gun violence in America. Minnesotans were affected by this shooting. Names of the victims have not been released yet. But we have heard from Minnesotans who were on the Delta flight that began in Anchorage, Alaska. They witnessed the shooting and the death and the chaos. Some were going on a cruise to take advantage of warmer weather during this frigid Minnesota January. Their cruise will now be different than they intended. Why? Gun violence has a ripple effect. Those who were at that baggage claim area witnessed people dying after being shot in the head point blank. One man said he smelled the smoke from the bullets fired and thought the shooter was just behind him. He will never forget that. Some passengers spent hours on the tarmac or sheltered in place. Some passengers spent hours on planes parked on the tarmac. Those at the baggage claim most likely thought that gun violence would never affect them. But in America, mass shootings happen at least every week and shootings happen every day. 90 Americans a day die from gunshot injuries from homicides, suicides and “accidental” gun discharges. Gun violence affects more than those directly hit by a bullet and their loved ones and friends. As it turns out, it affects all of us. We watch, horrified, on a regular basis as mass shooting after mass shooting takes place on live TV. The coverage is 24/7. We are all traumatized. Some suffer from PTSD after every one of these events, thinking of their own loved one who was shot in the head or torso and died from the injuries. Let’s talk about guns at airports. Guns can be packed in checked luggage at U.S. airports. If you intend to do this you must declare that you have a gun packed in your checked luggage. It must be in a hard sided locked case without ammunition which must be separate. The shooter appeared to have grabbed his luggage off the carousel and gone into a bathroom where he unpacked the gun, loaded it and started randomly shooting- reloading twice. Yes, someone could have walked into that baggage claim area with a loaded gun having parked a car or arrived by taxi and done the same thing. Guns everywhere is the norm in America and people are carrying guns everywhere. That is what the corporate gun lobby has imposed on Americans with the help of the lapdog politicians who believed in the lies and deceptions that more guns make us safer. And what we have is mass shootings in every public place in our country and also, actually more frequently, in private homes all over the country. They occur most often in guns allowed zones as it turns out. The gun lobby yells that these shootings only happen in gun free zones. In the case of this particular shooting, they are right. But in most cases, they are wrong. Don’t believe them. On a personal level, my sister’s shooting death happened in a guns allowed zone- a private home where most shootings occur actually. Because gun carrying has increased with almost every state having passed laws to allow ordinary citizens to carry guns, people do carry their guns around. If they are responsible, they will know where that gun is at all times and make sure it does not fall out of their pants or their purse, etc. That is why it is so ludicrous that so many airline passengers say they “forgot” they had a gun in their carry-on luggage. I urge you to read this TSA blog for more information. Also significant, 2,653 firearms were discovered in carry-on bags at checkpoints across the country, averaging more than seven firearms per day. Of those, 2,198 (83 percent)were loaded. Firearms were intercepted at a total of 236 airports; 12 more airports than last year. There was a 20 percent increase in firearm discoveries from 2014’s total of2,212. Pictured are just some of the firearms discovered in 2015. Wow. They have found many guns with rounds chambered and ready to go. Check out the photos provided on the blog. Grenades? Yes. Why not? If you are a responsible gun owner, you will know where your gun is and you will also know that there are many things that cannot be brought on board airplanes. I travel enough to be very careful about what I take in my carry-ons because I don’t want to be stopped and frisked or have my carry-on luggage searched. It is annoying to me as a traveler when someone takes something they shouldn’t in their carry-ons because it slows the TSA line down and adds to the stress of traveling. But I am happy that the TSA does such a good job of checking these things. I don’t want people armed on my flights nor do I want a grenade to go off on my flight. Remember that this happened after the terror attack of 9/11 to keep us safe. And yet, more people are terrorized by gun violence in a few weeks time than died in the attacks of 9/11. And, for goodness sake, more toddlers kill people with guns left for them to access by an adult than terrorists. All of this is the result of our unique and deadly gun culture. It doesn’t have to be this way. We can actually prevent and reduce gun violence by enacting stronger laws about the people who buy and carry guns. I saw a recent meme using the gun lobby’s claim that “guns don’t kill people, people kill people.” Yes they do. That is why we need to keep some people from getting their hands on guns. The shooter at the Ft. Lauderdale airport for example, we now know had some severe mental health problems. He had served in the National Guard and served a year in Iraq. He came back a changed man and even checked himself into a mental facility after telling the FBI in Alaska that he heard voices in his head.He had gone AWOL several times and got a general discharge ( likely for mental health reasons). And yet, he was able to buy a gun. In Alaska a permit is not required to carry a gun. Good idea? The shooter had domestic problems with his girlfriend in Alaska where he had lived and was a security guard. There were some misdemeanors on his record. There has been a report that the shooter was a permit to carry holder. Some of the gun rights folks on Twitter feeds have disputed that. Alaska does not require a permit as such to carry a gun for anyone over 21 who can legally possess a firearm so most likely the shooter could carry that gun, permit or not. No training requirements or classes required. Just carry a gun if you over 21. Does this shooter look like someone who should be able to buy and carry a gun? We can do something about this. The shooter’s family knew about his difficulties and mental health problems. There is a life saving measure that is called Gun Violence Restraining Order or Gun Violence Protective Order. Several states have passed such laws. In Minnesota it has been proposed but the legislature refused to hear it and take a vote. The shooter’s guns could have been removed from his possession temporarily under a law like this and his name could have been placed on the list of prohibited purchasers through our FBI’s national instant check system. Of course, we also need to require that every gun purchase go through a Brady background check in order to fully save lives. Why? Because the NICS list is only for federally licensed firearms dealers. Private sellers do not have to require life saving background checks. If we can save lives, why would we not? Do we really want those who are dangerously mentally ill carrying guns around in public places and shooting innocent Americans? If not, why do legislators refuse to hear bills that could prevent this? We have a choice. Insanity or sanity. I know what I choose. Ask your elected leaders to save lives. If they refuse to vote on this life saving measure, ask them why? They must be held accountable for refusing to consider options that could potentially save innocent lives. What is normal shouldn’t be. In this year when a President who is turning everything upside down under the guise of shaking things up, we are experiencing abnormal behavior. We can’t normalize it because it could be dangerous for our democracy. Just as we can’t normalize gun violence and pretend we can’t do a thing about it. Ask President-elect Trump if he has more than thoughts and prayers after mass shootings. He will be faced with as many, if not more, than President Obama faced during his 8 years in office. That is reality, not fiction. Tweeting about it is not enough Mr. Trump. Do something and stop tweeting. “We’re heartbroken for families who have been affected,” Obama said in an interview with ABC News’ George Stephanopoulos. The president commented on the frequency of mass shootings in the US saying, “These tragedies have happened too often during the eight years that I’ve been president. In an interview published by the BBC in 2015, Obama called the rise in mass shootings during his presidency his biggest frustration. And yes, those of us working on gun violence prevention comment after tragedies such as the Ft. Lauderdale shooting and take criticism for “using” a tragedy to further our agenda. What? There is not a day when we don’t have gun violence. Mass shootings are so frequent that if we wait until a different time we will never be able to talk about gun violence. And that is the agenda of the gun lobby and it’s minions. They don’t want us to talk about gun tragedies and gun deaths. This does not fit into their own scenario that guns make us safer. And so they try to stop us. My agenda is saving lives and living in a sane country. What’s yours? So we will write and talk about the inconvenience of gun deaths, mass shootings, suicides, domestic homicides, toddlers killing people in increasing numbers, guns found in carry-on bags, irresponsible gun owners, the effects of weak gun laws and whatever it takes to save lives. For if even one life is saved by our “agenda” we will have accomplished something important. What we want is action- not thoughts and prayers. Check out the images below that were posted on Twitter feeds and Facebook yesterday. This week is National Suicide Prevention Week. We can’t talk suicide without talking about guns. Why? Because suicide by gun is the majority of gun deaths in America. In 2014, there were 42,773 suicides, and 21,334 of these were carried out with a gun, according to the Centers for Disease Control and Prevention. Suicides comprise two-thirds of all gun deaths. The typical victim of a gun homicide is a young, black male. The typical suicide victim is a middle-aged white man. Roughly 80 percent of suicide victims are men, and 83 percent are white. Young people are also at an elevated risk of gun suicide. Among those aged 10 to 19, there were 2,259 suicides in 2014. Nearly half of those deaths — 41 percent — involved firearms, according to data from the CDC. The only more common cause of death for young people is accidental injuries, a category that includes traffic accidents and drownings. Farid Naib has told this story very poignantly because, as you can imagine, the pain is almost unbearable. It was his own gun that he had for self protection. And now his son, Cayman is dead over a momentary bad day. I have seen Mr. Naib speak at a conference and heard him tell his story. It was not easy but he knew that telling his story may help others understand the risk of guns in their homes and the tragic results that could occur as a result. As part of my work to prevent gun violence, I have met people from all over America who have lost loved ones to gun suicide. It is a violent death. And it is often avoidable. Suicides by gun count in the total number of gun deaths in America. Why would they not? Mental health is certainly a public health and safety problem. Easy access to guns is also a public health and safety problem. The combination is lethal. Now, after years of therapy and the right combination of medications, I have my bachelor’s degree, live in DC, and have been able to pursue a career in a field I am passionate about — gun violence prevention. I lead a normal life, though I am aware of my bipolar disorder every day and struggle with my moods often — even in periods of relative stability. 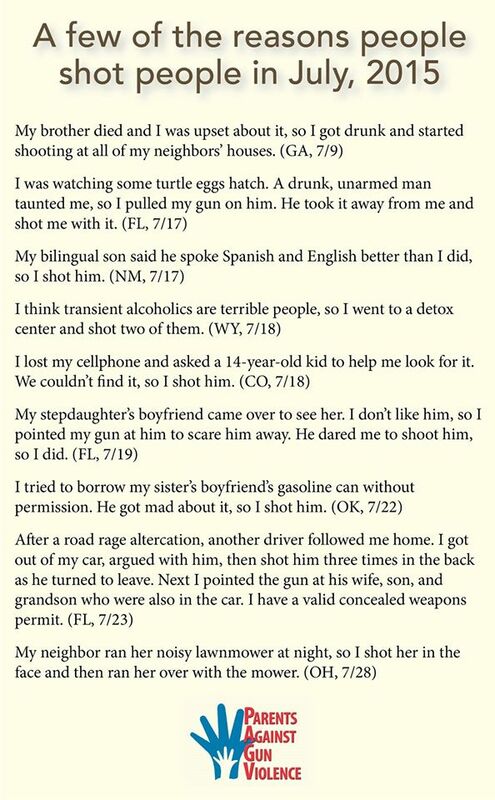 I know there are responsible, law-abiding individuals who have personal reasons for owning guns. But when someone in a household is in crisis, temporarily removing the quickest, most effective means of suicide can be life-saving. To call suicide inevitable is to give up on people with mental illness — people who could be successful, happy, full of life with the right treatment plan. Retrieving guns after the worst has passed is easy. Retrieving a life lost in a moment of desperation is impossible. Guns matter. If family members and friends recognize some of the signs or understand that having a gun around during times of depression, crisis, family problems and other problems, lives could be saved. The image at the top shows the truth of the matter. Many people who survive suicide attempts don’t try to kill themselves again. A gun is much more lethal than other methods and ends in death more efficiently and quickly. My brother-in-law committed suicide by jumping off a very high bridge. He knew it would be fatal and it was an awful event in the lives of our family. He was my husband’s only sibling. Between us we have each lost a sibling- one to suicide, one to homicide. We understand how devastating this loss of a loved one can be. We have handled our grief in different ways. My husband is more quiet and pensive and thinks about things we maybe could have done differently to recognize his brother’s depressed state and intentions. That’s typical when someone commits suicide. Another brother-in-law , my sister’s first husband, had undiagnosed bi-polar disorder and could be angry and volatile. It was difficult to raise a family and deal with his ups and downs. He never owned guns for which we were all thankful. It was her second husband, with depression and a lot of anger who used his gun ( he owned many) and shot and killed her. My brother, who served in the Viet Nam war has PTSD along with Parkinsons disease, depression and is now a former alcoholic. He owns many guns, even his service pistol. When we realized that his mental, emotional and physical status was such that he could become a danger to himself, we took the guns away and they have not yet been returned to him. He gave us permission to do this. Other families can do the same. This is a serious public health and safety problem and guns cannot be ignored as part of the problem and the solution. But it is not something we can’t work to solve. My path has been to get involved in ways to reduce gun deaths of all kinds by educating people, lobbying, learning about the issue, being involved in my local Brady Campaign chapter and the independent state group, Protect Minnesota as well as serving on the Board of Trustees of the Brady Campaign. I have traveled to Washington DC for meetings and conferences and meetings with my Congressional delegation many times. I have spoken to groups large and small, written OpEd pieces, testified at the state legislature, organized events, and many other things. It’s been a path of some victories and many challenges. Because of the people I have met who have lost loved ones, I am determined to continue what I am doing to make a difference. Telling stories about the risks of guns to families is important. Many gun suicides are unreported in the media so we don’t often hear about them. Families are bereft, may feel “guilty” about a family suicide or reluctant to speak about it. But more family members are speaking out. And, as it turns out, laws can matter. But few can survive a gun blast. That’s why the ICRC’s Catherine Barber has launched Means Matter, a campaign that asks the public to help prevent suicide deaths by adopting practices and policies that keep guns out of the hands of vulnerable adults and children. For details, visit www.meansmatter.org. What can we do to stop the killing? Murder-suicides are nearly always committed with a gun, and it is critical to stop potential killers from having easy access to firearms. One important step would be to restrict access to guns for individuals who have a history of domestic violence or have threatened suicide. Policymakers at the state and federal levels should pass stronger domestic violence prevention legislation to help keep guns away from domestic abusers. States should also establish domestic violence task forces. In addition, we need aggressive enforcement of laws that prohibit individuals with a misdemeanor domestic violence conviction or who are the subject of a restraining order for domestic violence from purchasing or possessing a firearm. Finally, we should establish a comprehensive, nationwide database to track murder-suicides, in order to fully understand the scope of this problem and how we can stop it. Suicide is commonly misperceived as a solitary, desperate act. Yet our research shows that murder-suicides claim the lives of spouses, intimate partners, and children — and nearly always involve a gun. We must immediately take steps to help prevent this especially horrific form of domestic violence. Mass murder is a form of suicide in that the perpetrator of such atrocities is often an enraged and fatalistic individual who intends to die at the scene of the massacre. From this perspective, the increase in mass shootings over the last ten years is very consistent with the increase in suicide. To sum this up, guns matter for those considering suicide. Gun suicides account for the majority of our country’s gun deaths. We don’t have to accept this nor should we. As a country we don’t sit back and accept the rate of death from auto accidents or smoking. We dig in and do something about reducing the chances of death and injury. Gun suicides are preventable. The fact that we are doing little to stop them is a sad commentary on our American gun culture. If we but do some common sense things and have the necessary national discussion we can save lives. It’s past time to deal with the tragedy of suicide and gun suicides in particular. Let’s get to work. Join an organization working on gun violence prevention and get involved. The organization with which I am involved is the Brady Campaign to Prevent Gun Violence and also the state independent group, Protect Minnesota. They can use your help, your energy, your financial donations and your talents.